Highland Cemetery has been the subject of much controversy since the 1930’s. There has been an on-going dispute over who controls the cemetery because of the fact that it lies solely in Shoreham Village within St. Joseph Township but is maintained by St. Joseph City. Former City Manager William Sinclair stated that they wanted to move the graves and headstones to Riverview Cemetery but the effort to do so was blocked by former St. Joseph Township Supervisor Orval Benson. Apparently, 14 acres of the area is located on a flood plain near Hickory Creek. At one point, St. Joseph Township officials requested to buy the property but the city put a price tag of $85,000 on it and the township thought the price was too high. Rumors still surface to this day of the possibility of moving the cemetery to another location, but at this time, the cemetery is not going anywhere and is still kept up by the City of St. Joseph. Sexton records confirm the burial of at least 108 people, although, only a small portion have headstones. The cemetery is mapped out but the headstones that are visible appear to be scattered randomly throughout the cemetery. Neighbors and longtime residents have mentioned seeing and hearing about the burial of many orphaned children and babies in a small section of the cemetery near the two-track path. This area does not contain any headstones or markers at this time but it was said that there used to be small wooden crosses marking the burial sites. There has also been some speculation that an Indian Burial Ground existed near the eastern part of the cemetery. People have reported finding relics and jewelry that appeared to be Indian but no documentation can be found substantiating this. Some areas in the cemetery are visibly “sunken-in” giving the impression of a burial site. Highland Cemetery also serves as the final resting place for several residents of the “Berrien County Hospital” in St. Joseph and five unidentified drowning victims pulled from Lake Michigan and the St. Joseph River. The Herald-Press featured two of these drowning victims in different news articles. Using police and witness reports, the reporter documented what few clues existed to the drowning victims identity such as approximate age, height, clothing description and even the exact contents of a pocket; “A Peoria, Illinois newspaper and a bottle of Bay Rum.” To this day, all five remain unidentified and buried in unmarked graves. The earliest burial on record is that of Elizabeth Kendrick who died in 1894 at the age of 86 years old. The most recent burial is that of Adam Williams who was buried on October 7, 1957. 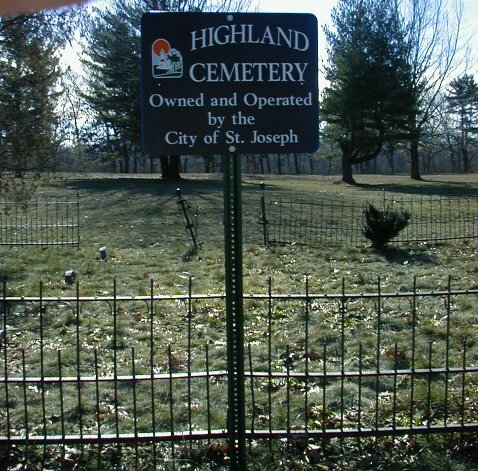 Highland Cemetery can be found on the St. Joseph Township Plat Map for 1903 bordering the property of J. Brunn to the East and W. Comstock to the West and extending to Hickory Creek on the South. Directly North of the cemetery was the P. Jenson property. A distinguishing part of Highland Cemetery has to be the inclusion of a small wrought iron fence with the obelisk of the Wadsworth family contained within. The family includes S. Porter Wadsworth, his wife, Sarah A. Boyce Wadsworth and his sister, Clarissa A. Wadsworth. Mr. Wadsworth is mentioned in “Portrait and Biographical Records of Berrien and Cass County Michigan” as being a noteworthy citizen of St. Joseph Township. Records show that they arrived in Berrien County in 1870 and settled on a 28-acre fruit farm in St. Joseph Township. Originally from New York, S. Porter and Sarah had a large family and are now eternally at rest, protected by the wrought iron fence. In November of 1980, David Savage of the Berrien County Genealogical Society began transcribing the headstones in Highland Cemetery. Using a list prepared by Edith Nichols, wife of the former sexton, David found many stones lost or stolen, dug up, moved and some barely legible. In the summer of 2001, Chriss Lyon, also from the Berrien County Genealogical Society, re-transcribed the remaining stones and merged this data with burial records and the original transcription. Again, many stones found in 1980 were not found in 2001.